Tender, moist shredded chicken perfectly seasoned with a homemade rotisserie seasoning blend. Easily made in either the Instant Pot or a Slow Cooker. Shredded chicken is one of the main recipes I make every week. It’s such an easy way to cook chicken breasts. Shredded chicken can be used in so many different ways! It’s a healthy addition to soups, salads, pasta, tacos, wraps or sandwiches. 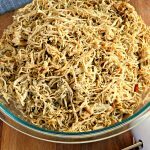 I have been making this rotisserie style shredded chicken in my slow-cooker for years. That was until I bought an Instant Pot. I picked up an Instant Pot during the Black Friday sales and it was a game changer for me! Seriously friends, if you do not have an Instant Pot buy one. It is SO worth the investment! I really, really, really do not like dry, underseasoned chicken breasts. So I came up with a perfect light seasoning blend that would compliment any way you decided to use the shredded chicken. The seasoning mix is a rotisserie style seasoning that is easily made with the spices you probably already have in your pantry. Add olive oil to the bottom of your pan to help keep the chicken breasts from sticking. Pour the gluten-free chicken broth into a glass measuring cup or bowl. You can also use bone broth or make your own broth by using gluten-free bouillon. Add the rotisserie seasoning blend to the gluten-free chicken broth and stir to combine. For the slow-cooker: cook on low 6-8 hours or on high for 3-4 hours. Make sure inner chicken temp reaches to 165 degrees. Once the cook time is over, turn the slow-cooker off. Pour some of the liquid out of the pot and shred the chicken breasts with the remaining liquid in the pot. I like to use my hand mixer to shred the chicken. Serve and enjoy! Pro Tip: You can freeze any leftovers. Just make sure the chicken comes to room temperature before you place into the freezer bags. There are a couple ways to shred the chicken once it is cooked. Chicken breasts coming out of your pressure cooker or crockpot are nice and tender and you can easily use two forks to shred them. I personally like to break out my hand mixer for a quick and easy way to shred the chicken breasts. Not only is it quick but it shreds the chicken breasts pretty uniformly, so you have the same sized shreds. Thank you to Schär for partnering with Mama Knows Gluten Free for this gluten-free Rotisserie Style Shredded Chicken recipe. One of my family’s favorite way to eat the shredded chicken is to make sandwiches with Schär Ciabatta Rolls. The Schär Ciabatta Rolls are perfect for shredded chicken sandwiches. 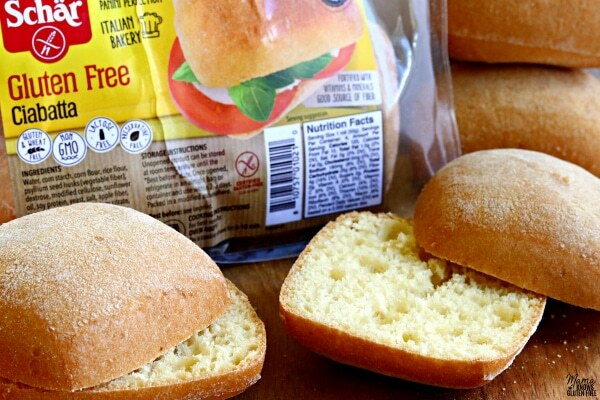 The Ciabatta rolls are soft and will not crumble while you are eating them. They are also the perfect size for the shredded chicken sandwiches too. Seriously, don’t knock it until you try it my friends. I promise you won’t be disappointed! Schär has a whole line of certified gluten-free bread, buns, rolls, crackers, cookies, pizza crust and so much more. Rotisserie Style Shredded Chicken is a super easy way to cook gluten-free chicken breasts. 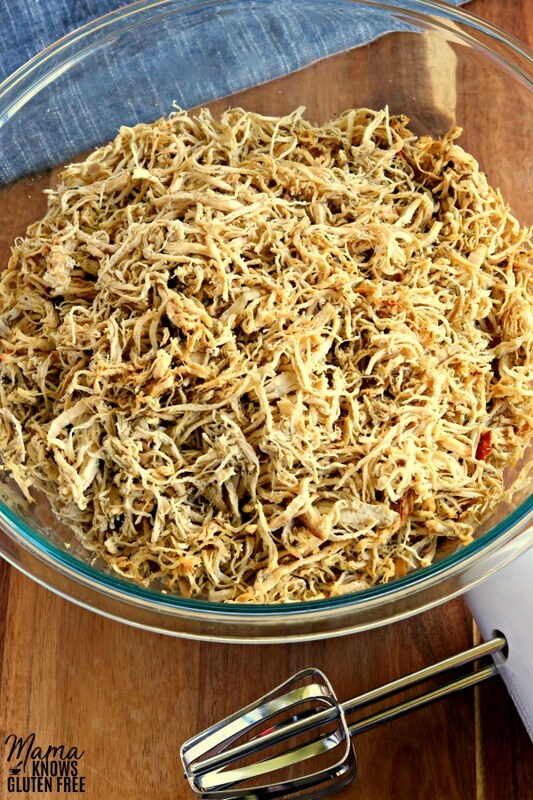 The shredded chicken can be used in many recipes or eaten by itself as a meal. It also makes meal planning easy and is freezer friendly! This easy gluten-free chicken breast recipe is also naturally dairy-free. It’s also perfect for those following the Paleo, Whole30 or Autoimmune Protocol diet. 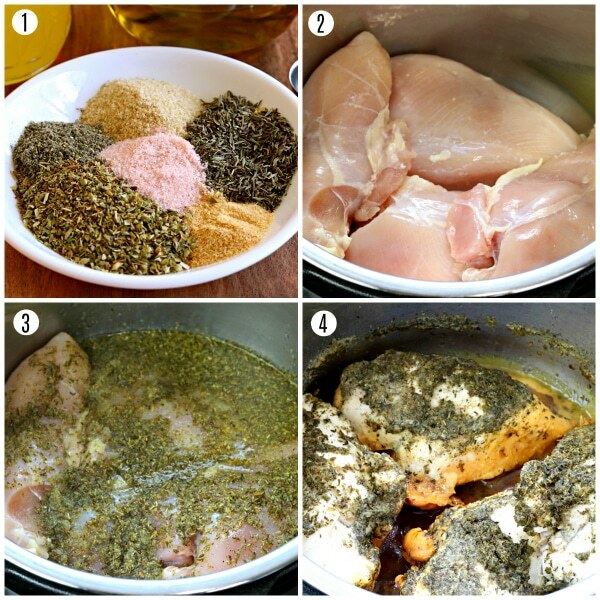 Looking for more gluten-free chicken recipes? Check these out! 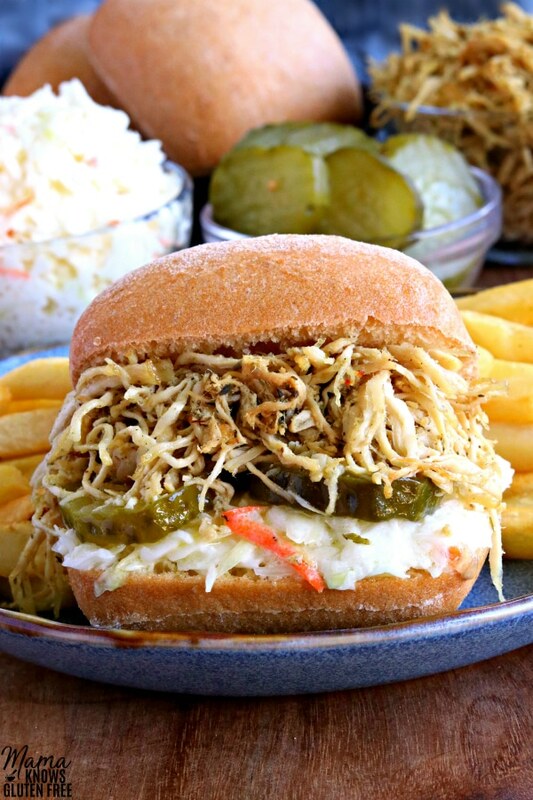 Rotisserie Style Shredded Chicken. 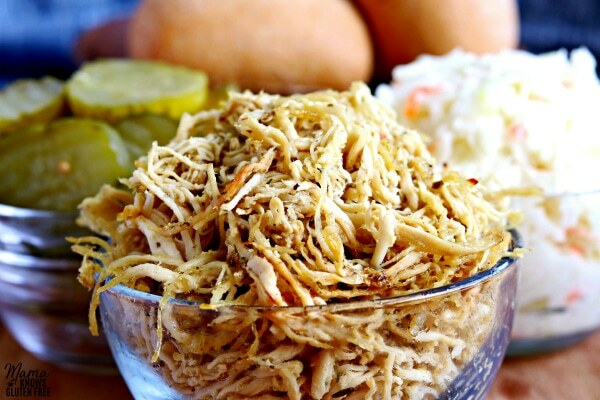 Tender, moist shredded chicken perfectly seasoned with a homemade rotisserie seasoning blend. Easily made in either the Instant Pot or a Slow Cooker. Gluten-Free and Dairy-Free. Perfect for those following the Paleo, Whole30 or Autoimmune Protocol diet. 1 cup gluten-free chicken broth You can also use bone broth or make your own broth by using gluten-free bouillon. Use all of the same ingredients as the Instant Pot recipe but use 2 cups of gluten-free chicken broth instead of just 1 cup. Add the chicken breasts to the pot. Add all of the seasonings into a small bowl and stir to combine to make the rotisserie seasoning mix. Pout the chicken broth into a glass measuring cup. Add the seasoning mix to the chicken broth and stir. Pour the seasoned chicken broth over the chicken breasts. Put the lid on. For the Instant Pot: turn the valve to sealing, and select Manual, high pressure for 12 minutes. It will take about 10 minutes to come to pressure and start counting down. Once the cook time is over, turn the Instant Pot off and let the pressure release naturally for 10 minutes. Make sure inner chicken temp reaches to 165 degrees. Shred the chicken breasts with the remaining liquid in the pot. I like to use my hand mixer to shred the chicken. Serve and enjoy! For the slow-cooker: cook on low 6-8 hours or on high 3-4 hours. Make sure inner chicken temp reaches to 165 degrees. Once the cook time is over, turn the slow-cooker off. Pour some of the liquid out of the pot and shred the chicken breasts with the remaining liquid in the pot. I like to use my hand mixer to shred the chicken. Serve and enjoy! To freeze, let cool to room temperature before placing in freezer bags. Just made this. The house smells SO GOOD! And the DH gobbled up the sandwiches I made with this chicken. Will definitely be making again. 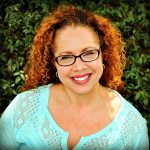 Thank you so much, Miri for the wonderful 5-star recipe review! I am so happy to hear that you both enjoyed it! I make this once a week and my family loves it. You can do so much with the shredded chicken. Thank you again! I have an 8qt IP and would like to double the recipe. Does the broth need to be doubled too? Hi Danielle! I only have the 6qt Instant Pot. I looked it up and the 8 Quart Instant Pot Models need 1.5 cups of liquid. I hope you enjoy the shredded chicken! It was delicious! I ended up making a huge batch of this with chicken thighs (but reduced the time to 8 min) then saved the liquid after cooking and used it as my base for matzo ball soup! Thanks so much! Thank you so much Danielle for the wonderful review! I am so happy that you enjoyed the chicken. I’ve made it with chicken thighs too, and my family enjoyed it. I need your recipe for matzo ball soup. It sounds delicious! Thank you again.